Beautifully engraved certificate from the eChapman.com, Inc. issued in 2002. This historic document was printed by the Security-Columbian United States Banknote Corporation and has an ornate border around it with a vignette of the company's logo: the eagle head. This item has the printed signatures of the company's secretary, Earl U. Bravo, Sr and president, Nathan A. Chapman, Jr., and is over 9 years old. eChapman.com was created in about May 1999 to capitalize on the dot-com frenzy, when just about any new Internet-related stock seemed destined for success. It was the third time in 16 months that Chapman was to take a company of his public. However, by the time eChapman was ready to go to market in June 2000, the demand for high-tech and dot-com stock was declining, the Maryland Securities Commissioners lawsuit said. Chapman had given eChapman.com a huge buildup, positioning it as a brokerage house that would cater to minority investors and an investment bank that would help minority-run businesses get needed capital. He initially sought to sell more than 3.33 million shares at $14 to $16 each, raising as much as $53.3 million. But the initial public offering, or IPO, was delayed several times and then was reduced in both size and price. 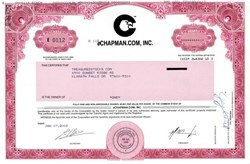 In the end, eChapman.com sold 1.26 million shares at $13 each, raising $16.4 million. Acting as lead underwriter, Chapman had trouble placing even the 1.26 million shares - a deal he was desperate to complete after having incurred more than $4 million in expenses related to the IPO, court filings alleged. Several investment banks took far fewer shares than they had promised, and other investment banks Chapman had listed as secondary underwriters later said they never agreed to play that role. According to prosecutors, Chapman and his company's brokers sold hundreds of thousands of shares to the firm's own clients - including some who had no idea the stock was being purchased for their accounts. One broker allegedly placed 308,000 shares of the IPO in customer accounts, financing the shares by selling other client holdings, or even making illegal margin loans. Even then, other shares were left to be placed. Since 1996, Chapman had been managing tens of millions of dollars for the $25 billion Maryland state employee pension system, selecting and supervising a group of smaller "sub-managers" who invested the system's money. According to prosecutors, Chapman authorized two of these sub-managers to buy 395,000 shares of eChapman.com using state pension money - though the stock didn't fit the profile of what they were supposed to be buying. One of those sub-managers, Alan B. Bond of New York, now imprisoned, had lost most of his clients after he was indicted for securities fraud in December 1999. But Chapman continued to employ him, which prosecutors said made Bond "beholden" to Chapman. NATHAN A. CHAPMAN, JR., ECHAPMAN, INC., THE CHAPMAN COMPANY, CHAPMAN CAPITAL MANAGEMENT, INC., EARL U. BRAVO, SR., DEMETRIS B. BROWN and DANIEL BALDWIN, JR.
SUMMARY 1. This matter involves a fraudulent scheme conducted by defendant Nathan A. Chapman, Jr., in connection with the June 2000 initial public offering ("IPO") of, and subsequent secondary market trading in, the common stock of eChapman.com, Inc. (now eChapman, Inc. or "ECMN"), a public company controlled by Chapman. ECMN is the parent company of a registered broker-dealer, The Chapman Company ("TCC") and a registered investment adviser, Chapman Capital Management, Inc. ("CCM"), both of which are also controlled by Chapman. In an effort to rescue ECMN's collapsing IPO, Chapman, defendant Earl U. Bravo, Sr., a senior officer, and defendant Daniel Baldwin, Jr., a TCCregistered representative, used Chapman's captive broker-dealer and investment advisory firms to make unauthorized ECMN IPO purchases for customer accounts, backdate ECMN IPO trades and place close to one-third of the IPO shares in the account of a CCM advisory client, and manipulate the market for ECMN stock after the IPO. 2. ECMN's price fell steadily from its $13 per share IPO price and never recovered. Faced with huge losses, Chapman used the IPO proceeds to manipulate the sagging market for ECMN. Rather than use the proceeds for the stated purpose of creating a family of Internet-based financial services companies, Chapman and Bravo, through TCC, used IPO proceeds to buy hundreds of thousands of ECMN shares in the months following the offering. As a result, ECMN was left without funds to implement the business strategies that ECMN had represented to investors were the reasons for the IPO. In further efforts to stem the losses, Chapman, Bravo, and others propped up ECMN's trading price by discouraging CCM's advisory clients and TCC's brokerage customers from selling their ECMN stock. The defendants concealed their fraud with false and misleading statements regarding the use of the IPO proceeds in quarterly and annual reports filed with the Commission, prepared and signed by Chapman and defendant Demetris B. Brown, ECMN's Chief Financial Officer. The fraud that Chapman orchestrated cost investors, including public pension funds, millions of dollars. 3. As a result of the conduct described in this Complaint, Chapman, Bravo, Baldwin, Brown, eChapman, Inc., The Chapman Company and Chapman Capital Management, Inc. have violated and, unless restrained and enjoined by this Court, will continue to violate Section 17(a) of the Securities Act of 1933 ("Securities Act"), 15 U.S.C. � 77q(a), Section 10(b) of the Securities Exchange Act of 1934 ("Exchange Act"), 15 U.S.C. � 78j(b), and Rule 10b-5, 17 C.F.R. � 240.10b-5, thereunder. 4. As a result of the conduct described in this Complaint, eChapman, Inc. has violated, and Chapman and Brown have aided and abetted violations of and, unless restrained and enjoined by this Court, will continue to violate Section 13(a) of the Exchange Act, 15 U.S.C. � 78m(a), and Rules 13a-1, 13a-13 and 12b-20, 17 C.F.R. �� 240.13a-1, 240.13a-13 and 240.12b-20, thereunder. 5. As a result of the conduct described in this Complaint, Chapman Capital Management, Inc. has violated, and Chapman and Bravo have aided and abetted violations of and, unless restrained and enjoined by this Court, will continue to violate Sections 206(1), 206(2) and 206(3) of the Investment Advisers Act of 1940 ("Advisers Act"), 15 U.S.C. �� 80b-6(1), 80b-6(2) and 80b-6(3). JURISDICTION AND VENUE 6. The Commission brings this action pursuant to Section 20(b) of the Securities Act, 15 U.S.C. � 77t(b), Section 21(d) of the Exchange Act, 15 U.S.C. � 21(d), and Sections 209(d) and 209(e) of the Advisers Act, 15 U.S.C. �� 80b-9(d) and 80b-9(e), to enjoin such acts, transactions, practices and courses of business, obtain disgorgement and civil penalties, and for other appropriate relief. 7. This court has jurisdiction over this action pursuant to Section 22(a) of the Securities Act, 15 U.S.C. � 77v(a), Section 27 of the Exchange Act, 15 U.S.C. � 78aa, and Section 214 of the Advisers Act, 15 U.S.C. � 80b-14. 8. Certain of the acts, practices and courses of business constituting the violations alleged herein occurred within the District of Maryland and elsewhere, and were effected, directly or indirectly, by making use of the means and instruments of transportation or communication in interstate commerce, or the means and instrumentalities of interstate commerce, or the mails, or the facilities of anational securities exchange. DEFENDANTS 9. Nathan A. Chapman, Jr., age 45, is a resident of Clarksville, Maryland. Chapman has been the President, Chairman of the Board of Directors, and the majority shareholder of ECMN since its inception. At all times material to the events described in this Complaint, Chapman was also the President, Chairman of the Board and Chief Compliance Officer of both registered entities, TCC and CCM, as well as CCM's Chief Investment Officer. Chapman holds various securities licenses. 10. eChapman, Inc. ("ECMN"), headquartered in Baltimore, Maryland, was incorporated in Maryland on May 14, 1999, under the name eChapman.com, Inc. Chapman is the majority shareholder of this public company. ECMN provides brokerage, investment advisory, and insurance services through three wholly-owned subsidiaries. On June 20, 2000, ECMN's shares began trading on the NASDAQ National Market. They currently trade on the over-the-counter bulletin board. ECMN is the parent company of defendants The Chapman Company and Chapman Capital Management, Inc.
11. The Chapman Company ("TCC") has been registered with the Commission as a broker-dealer since February 6, 1987. At all times material to the events described in this Complaint, TCC made a market in ECMN and, through Chapman and Bravo, placed quotations for ECMN on the NASDAQ system. 12. Chapman Capital Management, Inc. ("CCM") has been registered with the Commission as an investment adviser since August 29, 1988. At all times material to the events described in this Complaint, CCM acted as the investment adviser to the DEM-MET Trust. 13. Earl U. Bravo, Sr., age 55, is a resident of Baltimore, Maryland. At all times material to the events described in this Complaint, Bravo was the Senior Vice President, Secretary, Assistant Treasurer and a member of the Board of Directors of ECMN. Bravo was also the Chief Operating Officer, Senior Vice President, Secretary, Assistant Treasurer, and head of equity trading of TCC, as well as the Secretary and Assistant Treasurer of CCM. Bravo holds various securities licenses, and is a registered OTC equity trader. 14. Demetris B. Brown, age 47, is a resident of Woodstock, Maryland. Brown began his employment at TCC as the Chief Financial Officer in November 1998. From June 20, 2000 until he resigned on July 20, 2002, Brown was the Chief Financial Officer, Treasurer and Assistant Secretary of ECMN, TCC and CCM. He is a Certified Public Accountant registered in Maryland. 15. Daniel Baldwin, Jr., age 46, is a resident of Randallstown, Maryland. He is a Senior Vice President, Institutional Sales for TCC. As a registered representative, Baldwin holds various securities licenses.